The version shown here is a Sterling currency (£sd) Comptometer, with 10 £ decades, shillings, and pence. The machine in the photograph shows the total £123,456 19s 11d. 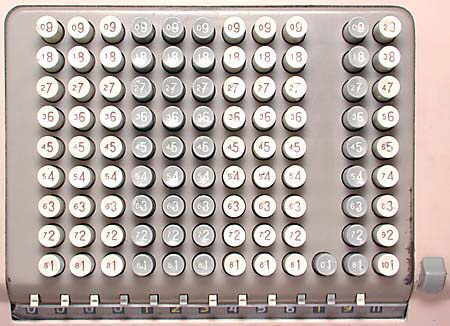 Note that the pence column does not have keys 1 to 11, only the standard number of decimal keys (1 to 9) so to enter 10d or 11d the operator has to successively press two keys to give the required figure. Serial number of machine illustrated 912/VB/S/142.712. The model number would then be 912/VB/S. 325 x 328 x 158 mm (12.8" x 12.9" x 6.1"). Introduced in 1963, price £160 GBP [about US$450]. Made in Great Britain by Bell Punch Company Ltd.
Bell Punch acquired the right to use the name "Comptometer" from the U.S. Comptometer Corporation in 1960. From left to right there are 9 columns of keys for Pounds, 2 columns of keys to give up to 20 shillings, and one column of keys to give up to 12 pence (there are only keys 1 to 9 so to enter 11 pence, for example, you have to press e.g. 5 and then 6). Grateful thanks to Del Harper for the opportunity to acquire this calculator. 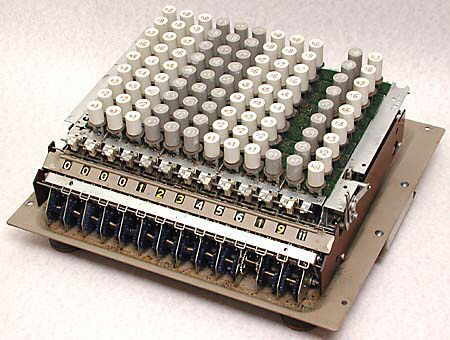 This machine was in use in an Engineering company until the end of the 1990s. The gentleman who used it was strongly urged to get rid of it, but he had been trained to operate it properly, which he could do very quickly and efficiently, so he continued to use it until his retirement. These machines for the old Sterling currency (£sd) can be used for normal decimal calculations by ignoring the rightmost three columns. 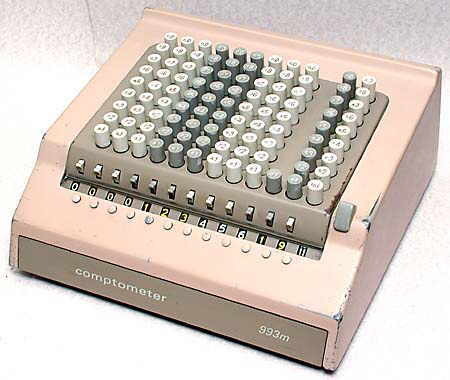 The machines of the 993 series were among the last new calculators of the "Comptometer" type to be designed. "Equipment Report", Office Magazine, July 1963, p584.